I am in San Francisco for a dozen days, the first time in almost 2 years back to the city I called home for much of my adult life. Anyone intrigued with San Francisco knows that rapid changes are afoot, fueled by the latest gold rush in digital media startups; those brash parvenus like Google and Facebook, Twitter and Tumbler, Instagram and Pinterest, and on and on. The nouveau rich and ambitious hope-to-bes are spreading across the city’s 49 square miles like kudzu, reclaiming pockets of urban wildlife and subduing the savages, their trailing circus of urban chic boutiques – the juice bars and gelato shops, yoga centers and organic groceries – driving prices up and diversity out, and replacing the riff raff of liquor stores, dive bars, and second hand bookstores in some neighbourhoods with more socially inspiring alternatives. It’s not all good and it’s not all bad, but it is creating tension amongst the masses and keeping the city abuzz. Never a dull moment in Bagdad by the Bay (a loving reference to the City by the late great columnist Herb Caen). As part of my trip I thought a series of mini dispatches on observations might keep me busy and out of trouble. Onward. 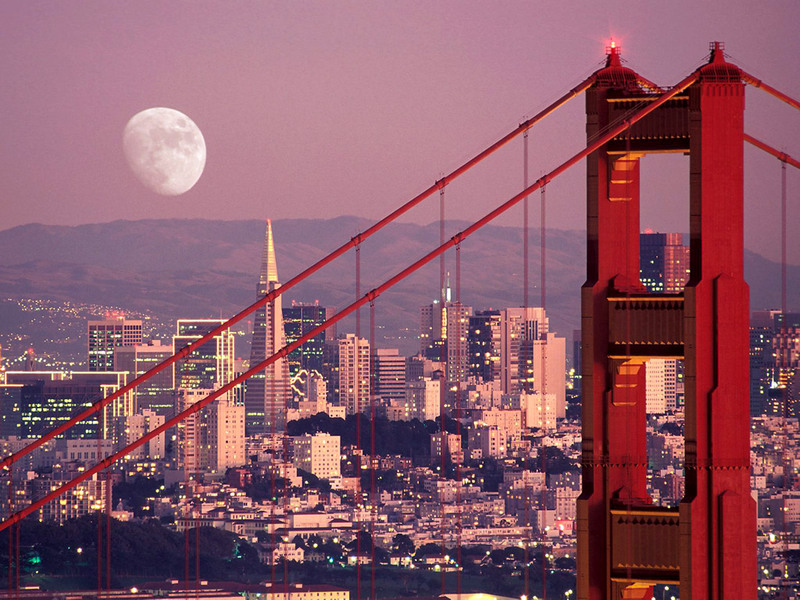 Is there a more beautiful American city than San Francisco? Are there more beautiful Americans than the San Francisco variety? It is a city made for 360° viewing – the homes, the hills, the uber-fit in their Lululemons – and every venture out is visual banquet. Why then does the 4 inch cell phone screen command the attention of everyone all the time and everywhere? To walk through historic Russian Hill is to see a stream of pedestrians on autopilot, eyes down and tapping out text, wholly clueless to the beauty around and obstacles ahead. Couples and friends sit at the trendy wine bars along Polk Street avoiding actual conversation – that audible thing we do with our tongue and lips – at all expense; sorry, but too busy snap-chatting to be distracted with real chatting. Last night I was enjoying a glass or 3 of delicious zinfandel at Amélie, a comfortable and friendly wine bar in the neighborhood. A young woman at the bar expresses interest in a certain menu offering and asks the sommelier to see the bottle, takes a photo of the label with her cell phone, reads an online review, and then orders a glass. I’m stunned. It would have been a bit easier and vastly more interesting for her to ask the young handsome sommelier for advice or even a taste, no? On Wednesday evening my Paris flight arrived just in time to catch the first pitch of World Series Game 7 with my twins. Excellent timing! We settled into a table at the Bell Tower, a bar/restaurant on Jackson Street, for what became a tense, exhilarating game, and everyone was on their feet for the final 3 outs. Pure delirium and fans-amongst-fans camaraderie; in San Francisco to watch the Giants about to win it all! I was dumfounded to see many in the crowd pulling out cell phones to record the game’s end. Let me get this straight: we are watching the game on a TV screen, which is already 1 digital step removed from the live experience. Now you are going to watch the game’s dramatic conclusion through your shaky 4 inch cell phone screen, which is recording a TV screen, putting you 2 degrees from live play, and this is enhancing the experience? Can someone please explain? Dispatch #2 – How May I Help You? One thing of which I never tire is American-style customer service. I love so many things about France, but great service – particularly for out-of-town visitors – is largely absent from there or anywhere in Europe. I can confirm that it remains alive and thriving in San Francisco. The waitress at the Bell Tower, our new nightly spot for drinks and one of the few in the in the neighbourhood where the twins and I can relax together – me with a beer, them with sodas – has memorised our usuals after just 3 visits and greets us with a “howdy, how are you all?” when entering. If we linger at a prize window table meant for diners, never a problem. If I order another round and we linger even longer, never a problem. And now we’re getting the “see you tomorrow?” on the way out. I’m trying to imagine that in France. 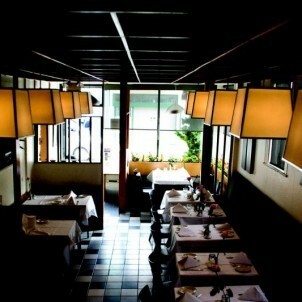 The Restorante Milano is one of the best Italian restaurants in a city full of great Italian restaurants. It’s a warm, intimate neighborhood spot in Russian Hill that fills quickly, lines at the door. I made reservations for 5 people on a busy Saturday night, then showed up with 7. Not a problem at all Mr. Magill, we can manage that. Let’s just move a few things around. Really? I’m trying to imagine that in France. I was meandering through the aisles of an expansive Walgreens today in search of milk and Q-tips, looking every bit like the lost tourist. I was asked twice by the staff if I was finding everything okay, if any help was needed. Now, I really cannot imagine that in France. I love San Francisco’s diversity of options and prices when it comes to eating, drinking, and having fun. Twenty years ago Alexandra (girlfriend, wife, ex-wife, still great friend) and I used to love Bob’s on Mission Street and 20th (or there-about). A half chicken roasted, sides, and a drink was priced under $4, which was an amazing deal. 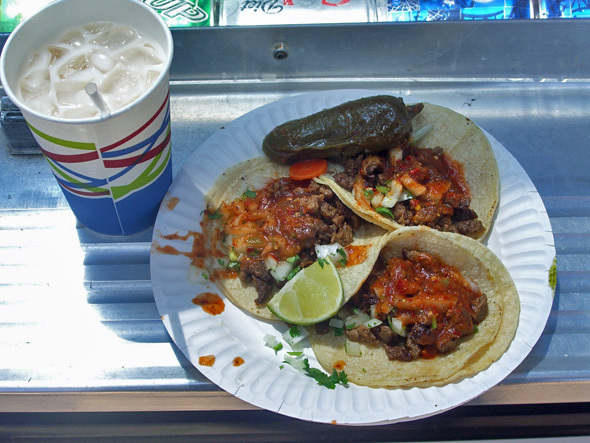 Tacos and an horchata from El Tonayense taco truck in San Francisco. Two burritos and horchatas last weekend at Nick’s Crispy Tacos: over $26. Ouch. Burritos used to be a real deal in this town and ran $5-$7 each at our old haunt on Ocean Avenue, depending on toppings. For a glass of horchata you would have tacked on another $1.50. Two croissants, 1 pain chocolate, 1 coffee, at La Boulange: over $9.00. I love this chain actually, but that’s pricey sustenance for a morning stroll around the neighborhood. No boulangerie in France will charge over 1 euro ($1.25) for croissants or pain chocolate, and 1.60 euros (about $1.90) gets you a small coffee. I admit that Paris can be the exception. The last time the French got upset about bread prices heads began to roll, literally. Maybe San Francisco needs a revolution?? A decent bottle of California red wine at the Jug Shop: over $20, much of it well over. Yes, a few things cost $10-$15, but those few things are not very interesting. That’s hard on the wallet, especially for nightly tipplers like me. And yes, wine IS a staple of a well-balanced daily diet! MUNI fares for the city buses and underground: $2.25. Less than 10 years ago it was $1.25. Not a huge deal per trip you might say, but when using the system daily, round-trip for school or work, that starts to add up. I expect to pay up for exceptional quality but where does one go any more in this fabulous city for a great bargain? Gourmet options are great, but sometimes we just want an honest meal. In France I’ve always bragged about San Francisco’s choice of prices and value to friends, insisting that amazing food was available for all budgets. Is that still true? This is one time that I truly hope to be proven wrong! I rarely seek out Asian restaurants in France. Twenty-five years of San Francisco dining has spoiled me in that food group; the quality bar is simply too high. France is truly a foodie’s dream – the daily open-air markets, the incredible tarts and breads and cheeses and wine, the exceptional small bistros tucked here and there – but it tends to disappoint in the ways of the wok or steamed dumplings. Yesterday we decided to load up before I shipped out and chose dim sum for lunch, sushi for dinner. 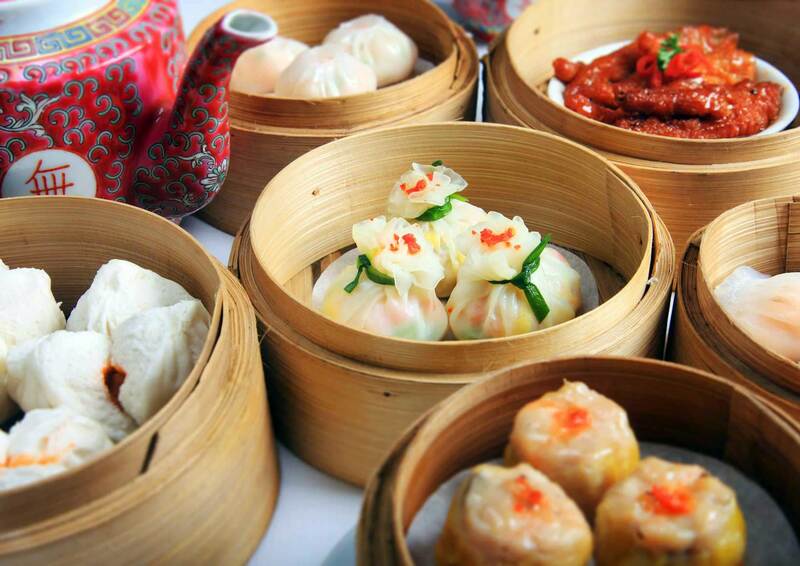 Ton Kiang is an excellent San Francisco destination for dim sum, the tapas of Hong Kong. Located in the fogbelt of the Outer Richmond district, the line at Ton Kiang starts by late morning. The variety of small plate bites that pass in a steady stream by your table is astounding: shrimp and spinach dumplings, salt and pepper shrimp (I swear they were still wiggling! ), deep fried crab claws, bbq pork buns, pork stuffed mushroom caps, vegetarian egg rolls, and on and on and on. With the lengthy menu of options there is something for everyone, so great family dining. We finished with our customary mango pudding covered in cream. Amazing. If a vote was held on which food best represented San Francisco I would cast my ballot for dim sum. It is a city full of immense variety, beautifully staged, best appreciated in small bites consumed slowly, plate by plate, neighborhood by neighborhood. 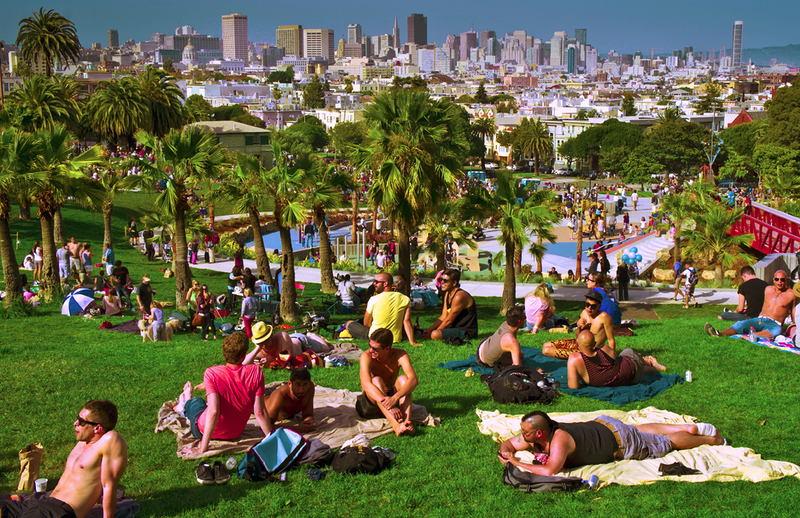 It is a city of distinct villages – Chinatown, North Beach, the Castro, Bernal Heights, Russian Hill, the Marina – some draped over rolling hills, others tucked into cozy valleys, and all distinguished by their own tribes and micro climates (and debating their claims to the city’s best weather). It is a city of extremes. The privileged old money on pristine Nob Hill perched high above and just blocks away from the destitute in the grimy Tenderloin. The eskimos of the foggy Outer Sunset cover in fleece while the sun worshipers in Dolores Park tan au natural. It has always been a city of old and young, rich and poor, immigrant and local, the prowler and the prey, a colorful mosaic of ethnic, sexual and spiritual diversity. Ahah – so true. Always difficult to re-adapt. I know first hand from my experience back in France (which only lasted 2 years…). Would love to connect if you were to have time during your stay in the Bay Area. I am sure you are highly solicited, but just in case you have few minutes for a coffee, let me know. Hello Stephan, it is great to hear from you. I would have loved catching up, but as you expected I’m a bit snowed under with commitments. Please give my best to the family!